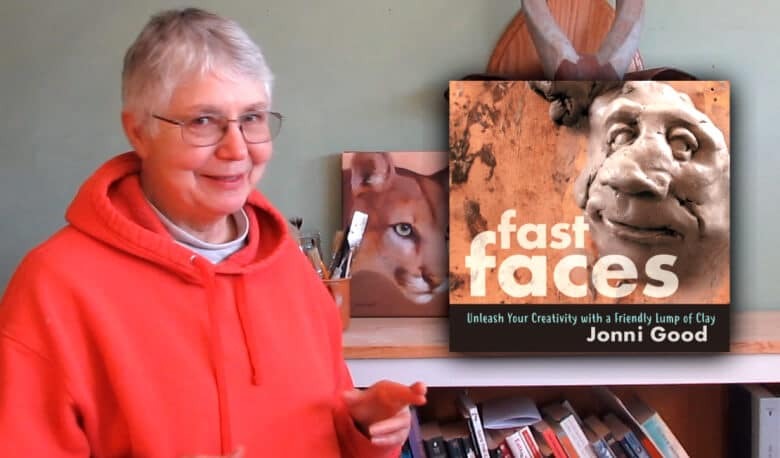 Fast Faces – My New Book Is Coming Soon! I’ve been working really hard on my new book about sculpting fast faces in clay. It’s available now, and I’m really excited about it. I can’t wait to get your feedback after you’ve read the book. This method of sculpting characters is so addictive that it slowed me down when I was writing the book. After you’ve made a few faces it’s really easy to see the beginning of features on a lump of clay. That’s a good thing, of course – but once you find a face, even if you didn’t intend to, you just have to get out your tools and bring it to life. It’s almost impossible for me to just walk away from it and go back to work. I need to do a few more minor things to get the book online (technical stuff, you know), but if everything works as planned the book will be on Amazon.com next week in a paperback and Kindle versions. I will let you know as soon as it’s available. Fast Faces Book Is Available! Can air dry clay ne used to make faces? You could use the air dry clay over an armature in place of paper mache – this portrait mask was made with shop towel mache, but the air dry clay could have been used instead. But you can’t use the air clay like the Fast Faces, because it would never dry all the way through and would crack. WOW – good for you! I look forward to getting it! Just ordered my copy and can’t wait to get it. I love what you said in the video about looking for things on a textured wall. It’s funny because I have tiles on my bathroom wall with stone floor. I find myself looking for things in the tile and it’s incredible that I see something different every time! I thought I was the only one who did that… kinda like looking for animals in the clouds… I love your videos and creativity..thank you! Thank, Terri! I have a tufted bathroom rug that has different faces and animals hiding in the shadows. (There’s something about being in the bathroom with nothing else to do …:) ) I’ve tried to come back and draw a particularly interesting face or creature, but it’s never there when I get back with a paper and pen. After you have a chance to see the book, be sure to come back and let me know what you think! Congrats on another book created ! Hi Jonni, looking forward to your next book. You have inspired me so much so I’m making all kinds of paper mache sculptures now thankyou. I’m glad to hear it. Thanks for the support! I hope you have reconciled your cover because it looks fabulous! What an interesting subject matter and you are right, it would be great to have students try it out. I look forward to reading your book and I will share it with one of my sculpture buddies that teaches ceramic sculpture as well. It may even become a course or part of a collegiate sculpture course! Well done! That would be fun! My dad is going to take a copy to the local community center, where there’s a teacher who has sculpting workshops for older students. He promised to pass on any feedback he gets. The little faces can’t be fired if they use the WED clay, of course, but if the ceramics instructor shows them how to use a pottery clay, and shows them how to hollow them out on the back after they’re dry enough, they would work really well. Then you could tuck them in with houseplants or out in the garden. Or make a mold and cast them in plaster or concrete, like I did. Hi Jonni, I am looking forward to seeing the book on Amazon, have 2 of your pm books already, and will get this one too. Thanks for sharing all your great work. Lesley, from Australia. Excellent..I can’t wait to see it ?? Thanks, Dru. You have a nice website, by the way, and your prints are beautiful. Wow, Jonni! How exciting. Looking forward to getting my copy. I know this will be a great seller. Thank you so much for all the time you invest in sharing your talent so that we might grow as artists.